When developing HTML5 games, sprite sheets are commonly used to implement frame based animations. A sprite sheet has multiple animation frames in a single image. 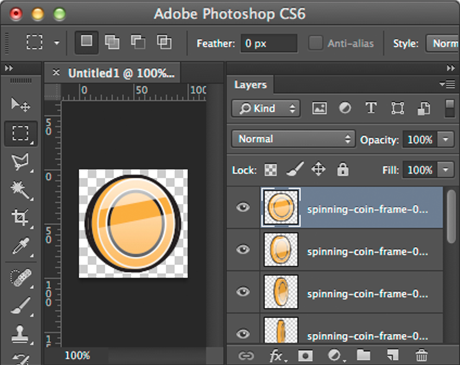 This article describes how to create a sprite sheet using the HTML5 Photoshop Sprite Sheet Creator script in Adobe Photoshop which combines multiple Photoshop layers into a single image. The script supports sprite sheets with frames that are the same dimensions and includes warnings for sprite sheets that will exceed the maximum size limitation in Safari Mobile. To install the script, simply drop the JSX file into Photoshop's script directory. If Photoshop is open you will need to restart it afterward. In Photoshop we will need each frame on a separate layer. 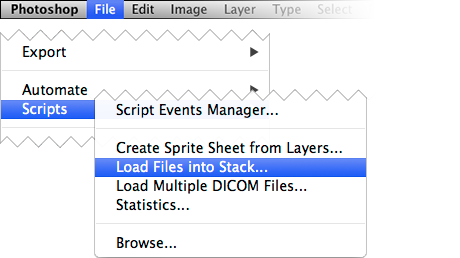 One way is to load external image files via the script File > Scripts > Create Load Files into Stack... which will import multiple image files into layers. Each layer represents one frame in the sprite sheet. 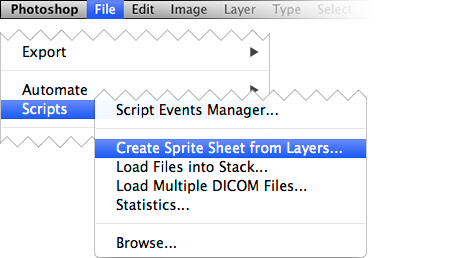 Point to File > Scripts > Create Sprite Sheet from Layers... to launch the HTML5 Photoshop Sprite Sheet Creator script. 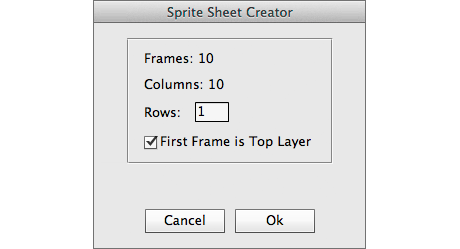 The sprite sheet creation dialog will appear as long as there are at least two visible layers available. If checked the sprite sheet frames will start from the top layer; if not checked the frames will start from the bottom layer. The number of rows can be specified (default is 1). If the sprite sheet image will be too large to be loaded on Safari Mobile if saved as a PNG. See maximum size limitation for details. If the sprite sheet image will be too large to be loaded on Safari Mobile (on iPod 4 or iPhone 3GS and lower) if saved as a PNG. See maximum size limitation for details. Clicking the "Ok" button will merge all the layers into one layer with the sprite sheet. Save the sprite sheet as a png or jpg and it is ready to use in your favorite game framework (e.g. BlocksJS). Why do I get the error "No document open"? The script requires an open Photoshop document. Does the script support frames that are different dimensions? Why do I get the error "Sprite sheet requires more than one visible layer"? The script requires at least 2 layers to create a sprite sheet. Code and example available at GitHub.